"Make up your mind. 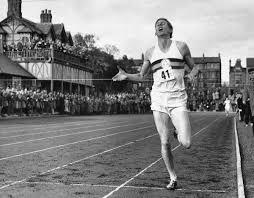 If you pass it up today you may never forgive yourself for the rest of your life.” - Coach Franz Stamphl's advice to a nervous Roger Bannister just before his record-setting run in 1954. The idea at the heart of the passage above — that you must seize the right moment or risk its passing forever — was very much a factor in the storied performance that has transcended sports and will always lift my heart. In many ways our sport is beautifully simple, all you do is lace up your running shoes and head out the door. So on the surface, it might seem like running should require less learning time, less training time, less equipment and less organization than almost any other fitness routine out there. The logical conclusion is there should be little need to learn skills, hire an instructor or join a club but now is your time! Statistics show that race participation by runners of every level of ability and ambition, in events of all sizes and every distance has grown higher today than at any other time in history. The whole world is welcome to share the starting line of a local road race, big-city marathon or trail ultra-marathon with the top runners in the world. The beauty of the half-marathon attracts marathon runners because of its ease of recovery and classic road racers because of its role as a springboard to the full marathon. But the half marathon (at 13.1 miles) is perhaps even more relevant to the 10K (at 6.2 miles) than the marathon (at 26.2 miles). Training at 10K pace works wonderfully well for the half-marathon. Running a few 10K races or time trials during the eight weeks before an important half-marathon can be excellent for your preparation too, but no less than two weeks before the event please, so your neuromuscular system can hold the good form and fitness you’ve gained from those hard efforts. If you’d like to find out how this approach works for your mind, body, and schedule, contact us to get started! One common marathon mistake is carrying out too many high mileage runs in the 4-week period before race day. For the average runner, to have healthy rested leg muscles capable of achieving the marathon distance, it’s better to “go long” every 2-3 weeks (rather than weekly) and to complete the last long run at least 4 weeks before the race. On alternate weeks you can relax more with some “best-easy” paced runs of 12-16 miles. Then 8 weeks before the marathon you can try something special – a ‘speed-endurance run’ where you finish the last hour of a 16 miler close to your 1/2 marathon race pace. Be very careful with these runs! Make sure your form and breathing are totally under control. It’s fine to slow down while you figure things out.